We’re unique. Just like everyone else. Susannah and I were married two months ago! She wrote about it beautifully here. I’ve got my own thoughts about the day, that I’ve tried to figure out how to frame without my story turning into an epic poem. This is one chapter. My wedding day was unique because I felt like everyone else. I recognize that this is a strange thing to say, especially coming from the West, where your wedding is “your special day.” Traditionally the couple is worshiped through all parts of the production, beginning with the engagement and continuing to the honeymoon. Every moment and experience is a treasure. As far as unique weddings go, it looked like ours would be the only one of its kind. Even how we got to the wedding was special: Susannah and I met each other as new teachers in our first international school posting. We became fast friends immediately, bonding through our similar experiences in our personal lives and in work back in the U.S.; eventually, we each realized there was more to the other than just a really great friend. Once we figured out there was something more there, things moved quickly. We started dating in March, got engaged in July, and were married in December. India has indeed been magical for us both. Our wedding planning enhanced the idea that we were truly unique – I was told by someone who knows a thing or two about weddings in Chennai that there is no proof of another expat couple marrying in a Hindu ceremony in the history of this city. (And given the bureaucracy, no one is likely to follow in our footsteps). So, in other words, there’s never been, nor will there ever be again, a wedding like ours. Major unique points for us. 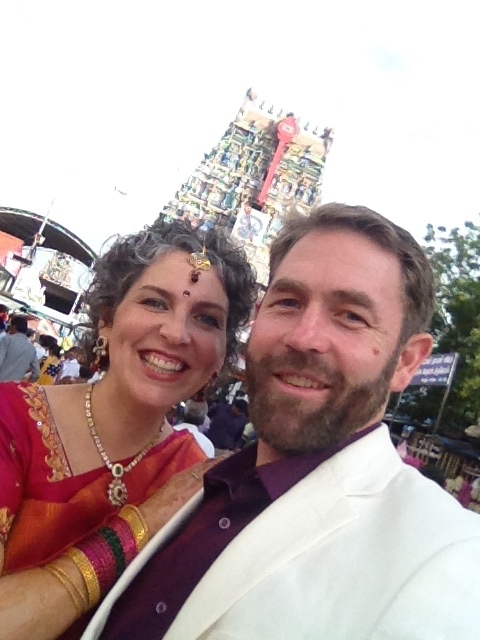 We got hitched in a Hindu wedding hall, down the street from Vadapalani Murugan Temple, in Chennai. Our date was chosen for us by the marriage hall officials – which was a surprise to us. They consulted the almanac for auspicious times and dates, and our date, a Saturday, was simply unacceptable to them. But look! – the previous Wednesday was a very auspicious day. So Wednesday it was. We even got the best time according to the almanac: 9:00am. I don’t know of anyone who got married on a Wednesday morning, so I thought this was unique, too. Wednesday morning turned out to be an original thought for a lot of other wedding planners, too. We arrived at the appointed location ahead of time to find waves of happy people flooding down the street, past where the marriage hall was located, towards the big temple at the end of the block. Streets were blocked off, and from every direction small wedding parties slowly made their way to the same destination. I asked what was happening and I was told that the big temple at the end of the street would conduct ceremonies for fifteen hundred couples throughout the day; just in our little wedding hall there were 20 couples signed up to follow us. Everyone on the street, and on the side streets and allies connecting to it, was there for a wedding. All 1500 couples were there for their unique wedding day. Just like us! 1500 couples is a lot of brides and grooms. It’s even more unusual to see so many other married couples if you are one of them. I was struck by how many other grooms there were, and that despite the fact that we were obviously very different, and would never see each other again, we had this moment of being the same together. I made eye contact with dozens of these other men, and as I met each one’s eyes I felt a moment of recognition. They weren’t all in the same emotional space – there were a few guys who looked panicked, and others who were cool as cucumbers – but it was moving to be having an experience so unexpected and unlike anything I’d heard of, and to be sharing that with a lot of other grooms who were going through the same ceremonies as me on this morning. Instinctively, I knew that I was part of something much larger and important than just me, or me and Susannah. We were unique, just like all these other couples. My special day with Susannah was sanctified by the presence of strangers in multitudes, helping me see that I’m part of a human ritual that’s both unique and quite common. India forces you to surrender to its will, and when you want to have things your way it’s really frustrating. My understanding of the power of God is similar, and my wedding day has helped me see this relationship more clearly. When I’ve asserted my own will, I’ve been alone and frustrated. When I’ve listened and surrendered, I’ve received what I needed in great abundance. Seeing all those grooms reminded me of that, and helped me savor a short ceremony at a crowded temple with the woman with whom I stumbled into when I got here, and with whom I’m thrilled to share so much time and love. I may not be the most unique newlywed in Chennai, but I definitely feel like the luckiest. Love this Andrew. I can picture the scene in my head and appreciated your words or wisdom. So, so happy for you guys. Andrew, I loved reading this (and also Susannah’s post). I think this post epitomises perfectly, the kind of couple you both are 🙂 Lots of love to both of you. P.S. : Write that epic poem! Andrew, I left a poem I wrote the evening of my wedding on Susannah’s beautiful story. I felt a little weird, like I was crashing or something, but you nailed it. Weddings are really shared, timeless experience. I haven’t gone to a wedding since when I didn’t take Lenore’s hand and reestablish the vows, quietly in my heart. Marriages need those little ‘reset’ opportunities… remembering why and who and what. Maybe ‘reflective’ is better than ‘reset’, but it is a moment, a spark, of energy, like eye contact.